(L) Mens Vintage 70s Western Shirt! Brown w/ Colorful Birds & Flowers! 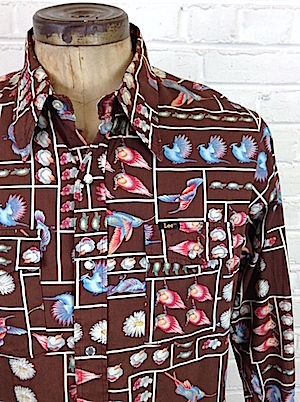 Home > Items just added 4/3-4/17 > (L) Mens Vintage 70s Western Shirt! Brown w/ Colorful Birds & Flowers! Mens vintage 1970s Western shirt! 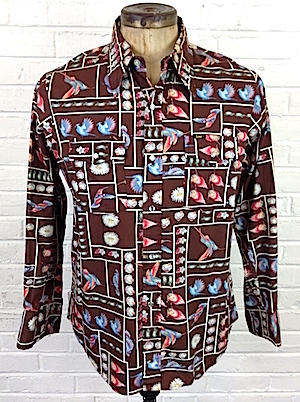 This whimsical, brown Western is covered in colorful images of birds and flowers separated by white lines! Has an extra wide collar. Closes in the front with pearly white snaps with two matching buttons on each cuff. Two patch pockets on the chest, each that closes with a flap and snap closure. Shirt has a tapered hem. Tagged by Lee. No material tag, but feels like polyester/cotton blend. Made in the U.S.A. Condition: Very Good. Has some slight yellowing on the interior of the collar. Does not detract from the awesomeness of this shirt! Chest: 45 LARGE. Shirt is tagged XL< but we are measuring it closer to a Large. Please check your measurements before ordering.